An interior designer and kitchen designer join forces for a kitchen redo. 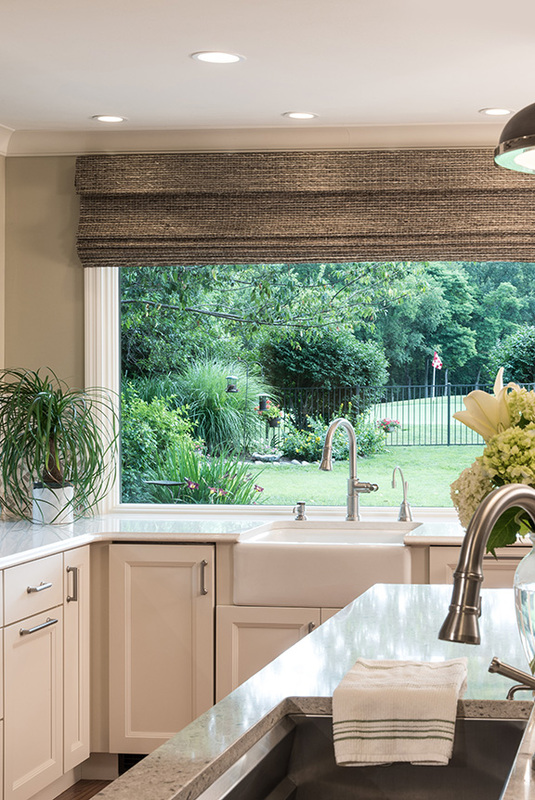 Long-time clients approached interior designer Nancy Barrett of Beautiful Rooms in early 2015 about renovating their dated kitchen and expanding its size by knocking down a wall and adjoining the space with an attached sunroom. "The overall goals were to open up the space and brighten up the kitchen," the homeowner explains. 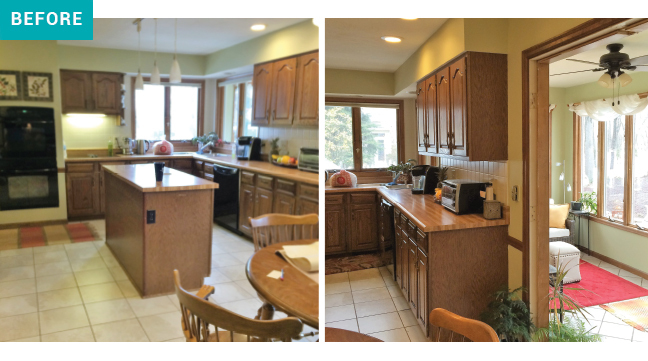 "My previous kitchen had dark cabinets, and while working I couldn't see outside unless I was standing at the sink. I wanted to bring the outdoors in." Given the scope of the project and structural challenges present, which included raising the floor between the two spaces, knocking down a wall and moving exterior windows, Barrett called on colleague and kitchen designer Julie Baum of BaumHouse Design to assist her with the project. Julie worked with the homeowners to put together the layout and design including cabinetry, tile and appliance selection. 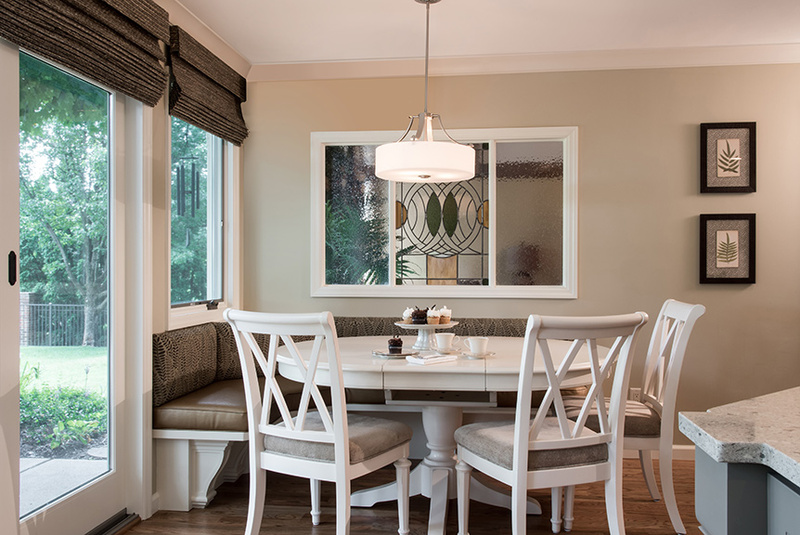 Nancy added her expertise in the decorative elements like paint colors, fabrics, furnishings and light fixtures. With the overall goal of a large, functional kitchen with lots of storage and space to entertain, the design team got to work creating a transitional space with clean lines that would complement the rest of the home’s style. Along with the structural changes, the existing floor had to be replaced because of the level change in combining the kitchen and sunroom. Barrett suggested doing wood, which also would match the wood in the family room making “the space appear larger and flow well together,” she explains. 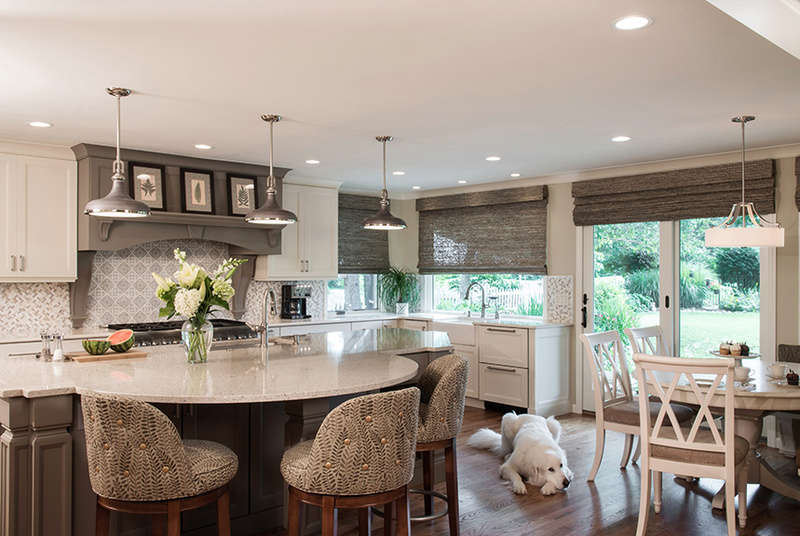 The kitchen design was to include a large island, two sinks, a bench near the garage entrance and banquette. For cabinetry selections, storage was a big consideration. Baum chose flat-panel cabinet doors with a coved molding to accentuate the clean lines and add a bit of a dressier look. 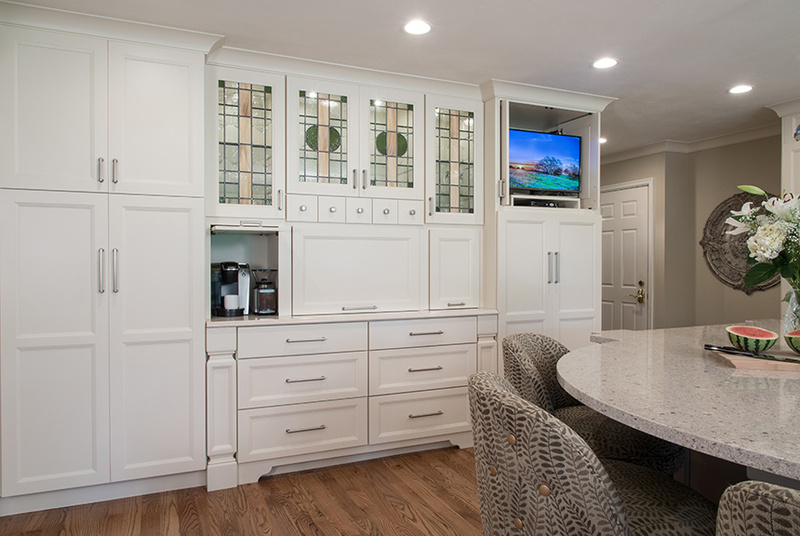 The perimeter cabinetry is painted a custom Sherwin-Williams taupe, while the island cabinetry and massive wood mantel hood contrasts in a darker shade. 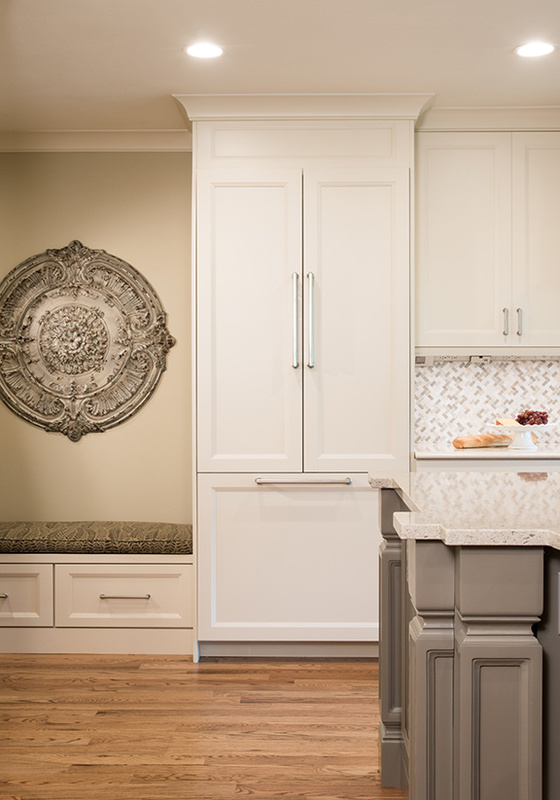 Cabinetry panels conceal all the appliances, except for the 48” gas stainless-steel range and microwave drawer. On one side of the space is a wall of pantry cabinets with lift-up appliance garage storage and retractable doors for a TV. Pullouts on either side of the range house tucked away places for utensils and spices, while the island has built-in shelving for cookbooks and pullout baskets for produce. The homeowners are avid entertainers and parents of teenagers that frequently hang out in the kitchen with friends, so the island had to be expansive with the ability to seat four. In order to fit four as well as an eat-in area in the kitchen, Baum had to be creative. “We went with a bump out, half-circle shape so that the chairs could fit around it and not be in the way of the table,” she explains. Behind the banquette, a beautiful piece of stained art glass by Cosby Art Glass took the place of a previous window to allow light to pass through. The design is Barrett’s spin on a Frank Lloyd Wright motif. “We didn’t want anything too flowery,” she explains. “We wanted to stick with the simple, clean lines of the kitchen.” The same glass is repeated in the cabinet glass doors for a fabulous finishing touch. 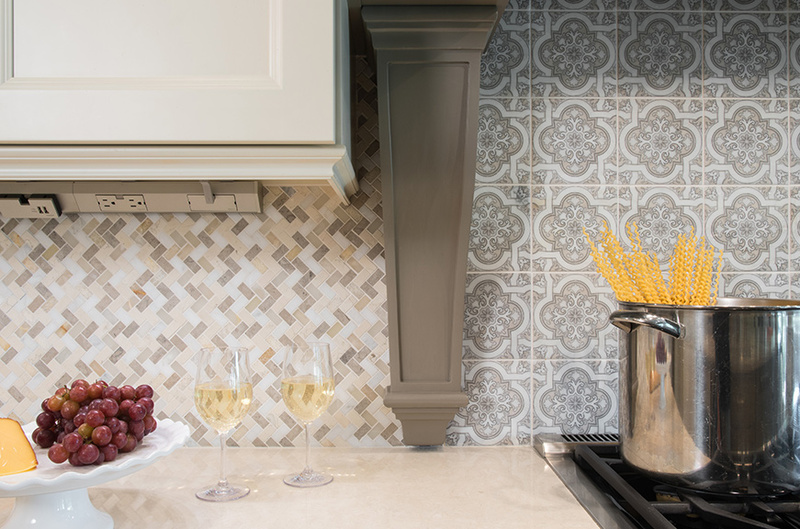 While the homeowners are thrilled with the smart storage and plenty of space for entertaining, there is one aspect of the new kitchen that is their favorite. "The windows! I love that I can be anywhere in my kitchen and see the beautiful landscape and natural colors of the outdoors," the homeowners says. And as for Barrett and Baum... there is the old saying about having too many cooks in the kitchen, but in this case, they say there were not too many designers for this one.